littleBits is an easy-to-use platform of electronic building blocks that inspires students to invent. The wide variety of parts and intuitive click-together system allows students to fearlessly experiment, leading to deep learning and an exploration based mindset that lasts a lifetime. With littleBits, kids have the opportunity to be more than just consumers of technology... they learn to create the world around them. Today's students are tomorrow's leaders! 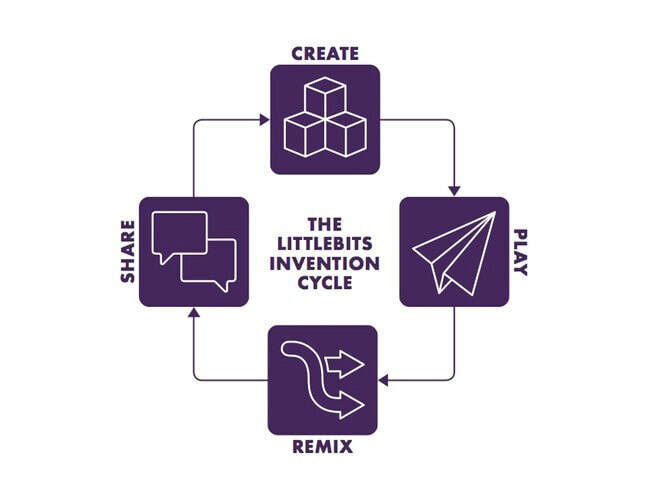 littleBits inspires students throughout every stage of the learning cycle, encouraging them to continually innovate and expand their skills. The continual cycle of creation, evaluation and innovation also helps children develop confidence and resiliency. LittleBits use color coded connectors to help students quickly identify the function of each part. They click together with magnetic attachments, making it easy for students of all ages, without needing to worry about accidentally cross-wiring.